MINI TICKET (LOW SEASON): MINI Tickets represent the best value for money, but can only be used on MINI Season dates. Please see calendar for valid dates. These tickets cannot be used at any other time. MAGIC TICKET (HIGH SEASON): The Magic Ticket is valid for all of the MINI Season dates listed below as well as more popular MAGIC DATES. 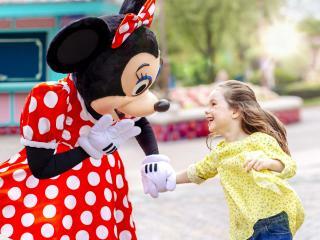 These include some school holiday dates and weekends, giving you more choice when to visit Disneyland® Paris. Please see calendar for valid dates. 1-Day/1 Park Disneyland® Paris Tickets are open-dated and can be used on any day within the valid season dates listed in the description. Should your planned visit date change, Mini and Magic tickets can be upgraded at the gate with a supplement payable direct at one of the ticket booths at the entrance to Disneyland® Paris. Your gate-ready Disneyland® Paris Tickets will be uploaded to your online order and you will receive an email when they are ready to download: Please note - If you are not travelling within the next 72 hours then it can take up to 7 days for your tickets to be uploaded. You must download and print your ticket before you visit Disneyland® Paris. Upon arrival at Disneyland® Paris, simply scan the barcode at the gate for admission to the parks. MINI and MAGIC Tickets have date restrictions and can only be used on one of the dates listed on the calendar. If you visit on a date that your ticket is not valid, you will need to pay the difference to upgrade your ticket in order to enter the park. Please see calendar for valid dates. All Disneyland® Paris Tickets include the fantastic Standard FASTPASS®, a free, time-saving service that shortens your wait at the most popular attractions in Disneyland® Park and Walt Disney Studios® Park. The Standard FASTPASS® is operated on a rolling basis so you can only ever have one Standard FASTPASS® at a time. This is done in the park and cannot be done in advance. To get your Standard FASTPASS®, approach the ride you would like and you will see a FASTPASS® kiosk if the ride participates in fast passes– normally next to the main queue. There will be a time displayed above the kiosk and this indicates the time you can return to join the FASTPASS® queue. You need to scan your tickets at the ticket machine and you will be given a Standard FASTPASS® ticket. You then return to the FASTPASS® queue at the time indicated. Fast passes are subject to availability. Tickets MUST be booked at least 24 hours in advance. Not valid to use same day of purchase. Once booked and confirmed this ticket is non-changeable and non-refundable.